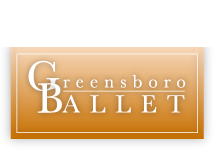 Greensboro Ballet and the School of Greensboro Ballet are very dependent upon the generosity of the Triad community for donations, sponsorships and gifts. Scholarships for students in need of financial assistance. In-school educational programs including our CityDance Greensboro and Dance in the Schools programs. Nutcracker school show at the Carolina Theatre for thousands of Guilford County students. Dancing Above the Barre program for children with mental and/or physical disabilities. Free performances around and for the Greensboro community. Guest artists, teachers and choreographers for our students to work with and our audiences to enjoy. Your donations also help with the general operations of our performing Company (costumes, sets, marketing, production costs) and our School (teachers, accompanists, technology needs, etc). To make a donation now, please click on the Paypal link below, go to our Online Donations page or click HERE for a downloadable form.